Thick "Wadding" protects the inside of the speaker cabinet. This can be seen if the speaker cabinet is removed. Basically, wadding is a white chemical silk type of material that we put inside the speaker cabinet for multiple reasons. It helps make the sound more clear, and at the same time protects all the parts inside the speaker. This material is also a fire retardant. This is unique to our speakers. Most other brands do not take this step due to the cost of the material, but it is a game changer if you are trying to create the best speaker! Amplifier: Class D, very efficient amplifier with top components! Rockville HTS8B black dual 8" complete home theater system. 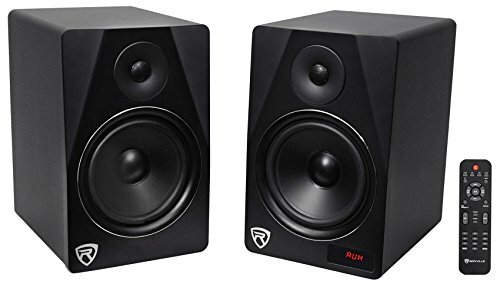 1000 Watt powered bi-amped speakers (Pair). RMS Power: 250 Watt. Two-Way Speaker Design. Quad Amp Design: Each Driver Features Frequency Specific Independent Amplifiers. Built In Bluetooth with 150 foot range and perfect interference-free sound quality. Built in USB playback. Built in SD card playback. Built in FM radio with crystal clear reception. Digital display on front panel with brightness control. Full function remote included. Enclosure is made of top quality MDF wood. Our enclosure is not particle board, it is true high-grade MDF! The enclosure is 0.5" thick while the front board of it is a full 1" thickness to give you the ultimate best sound quality!. Comes in 3 enclosure finish options Wood finish painted black. Wood finish painted white. Wood finish with vinyl front board. We use "baking paint" made for wood surface. It lasts long and is the best paint for speakers!. Beautiful finish is matte with a slight shine to it. Our designers spent a lot of time on the color to make it beautiful and elegant looking to improve the appearance of your studio or room. The enclosure is built with the perfect amount of air space to maximize sound quality for a studio. The port is built to the perfect spec to enhance the sound. Full Range Class "D" Amplifier Circuitry with Auto-Switching Power Supply. LED Power on Indicator on Rear Panel . Ferro Fluid Enhanced 1" Neodymium Silk Dome Tweeter With Metal Grill Protection. Tweeter has 1" voice coil diameter . Curved Front Bezel Design Eliminates Standing Wave Distortion. Injection Molded Polypropylene Cone Woofer. Rubber woofer surrounds increases sound quality and eliminates unwanted distortions. Computer Optimized Electronic Crossover Network Supplies Amazing Sounding Highs, Lows, and Mids. Rear-Firing Port Shaped and Designed by Sound Engineers to Reduce Port Turbulence and Deliver Distortion Free Top Sound Quality!. We developed the Most Optimized Magnet structure, Cone, and Cabinet Space that Reproduces the Sound to Play Back Exactly the Way it was Recorded!. Specially Wound Voice Coils Produce Accurate Response along Entire Frequency Spectrum. Distortion-Free Playback Even at Max Volume Listening! Very Clean Sound!